Do all great projects have such humble beginnnings? I’m an artist, and Pablo is my dog. He’s the reason I started exploring The Wilds – I live nearby and he likes walking there. And so it came to pass that James Delaney became a champion of cleaning up the overgrown Wilds and restoring it to a desirable public space. But let’s start at an earlier beginning. 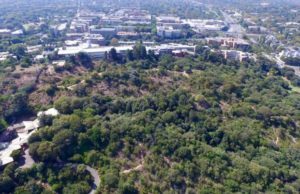 In 1925 Barney Barnato’s company JCI, donated some 40 acres of land to the City with the proviso that it be kept an open and public recreational space. By the mid 1930s there was a programme to plant up the space with only indigenous plants and trees. 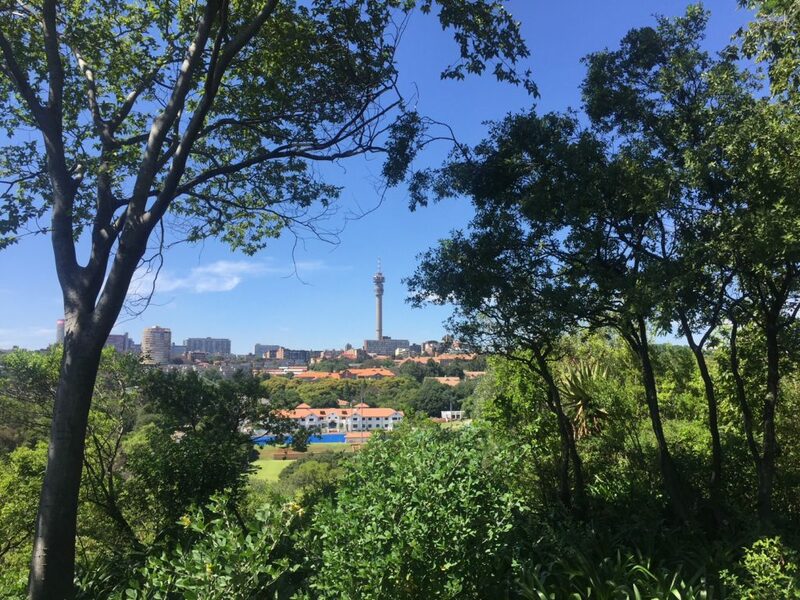 And this large urban forest bounded by Killarney, Houghton and Parktown with its rocky slopes and magnificent views, became a very popular picnic and leisure space for many decades. However during the 1990s, the Wilds gradually became a no-go zone with crime incidents and the more deserted it became so the more unkempt and overgrown it became. 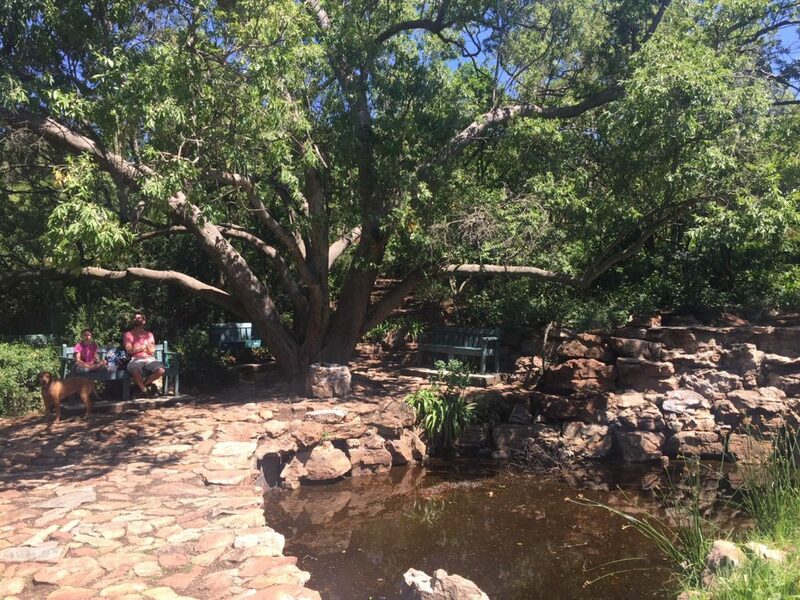 When James and Pablo started venturing into the Wilds over 2 years ago, much as James loved having his own private park, he wanted this beautiful space with its stunning vistas, stone paths, pools and wonderful indigenous plants and groves, to be shared by the broader public. 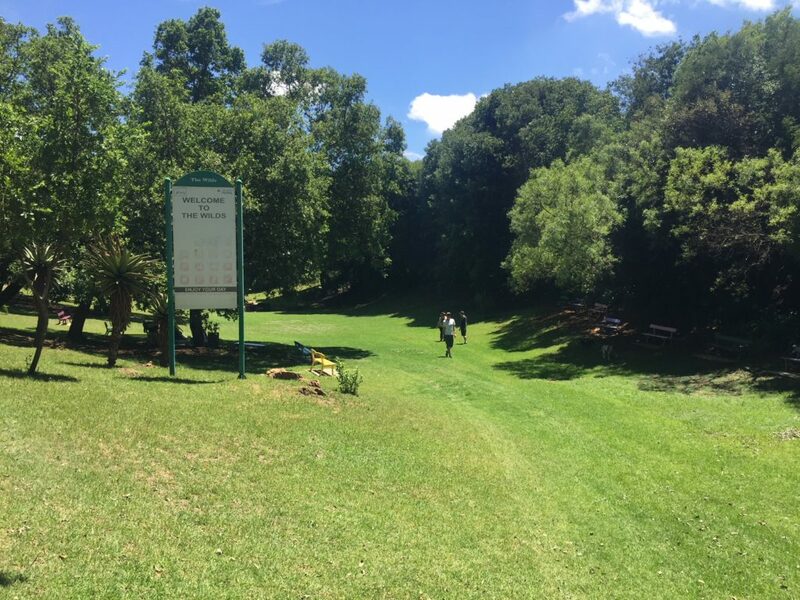 And so he, along with Wilson Molekwa, City Parks’ site manager, and his permanent on-site team, began cutting away the thick overgrown vegetation, clearing the undergrowth and pruning trees to bring in more light. All this made for a safer more attractive space in the western section of The Wilds which is now also fully fenced with security at the gate. (The eastern section of The Wilds (bordering Upper Houghton) is still fairly overgrown and less visited.) Volunteers came to help with the clearing as well as painting the park benches – no old style ‘Public Works green’ but rather fab purples, yellows, blues and reds. Stay at our well located Guest House and take a walk on the wild side. 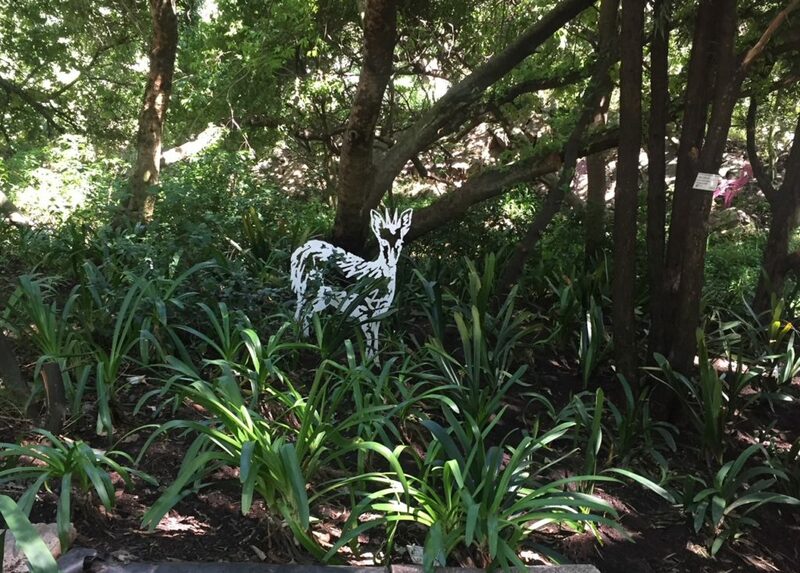 View our Craighall Guest House for Rates and Availability! 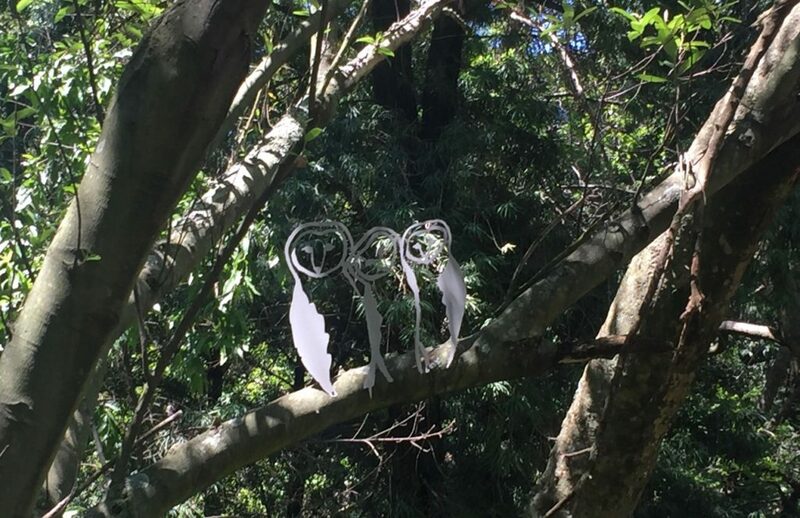 And then came the owl project. 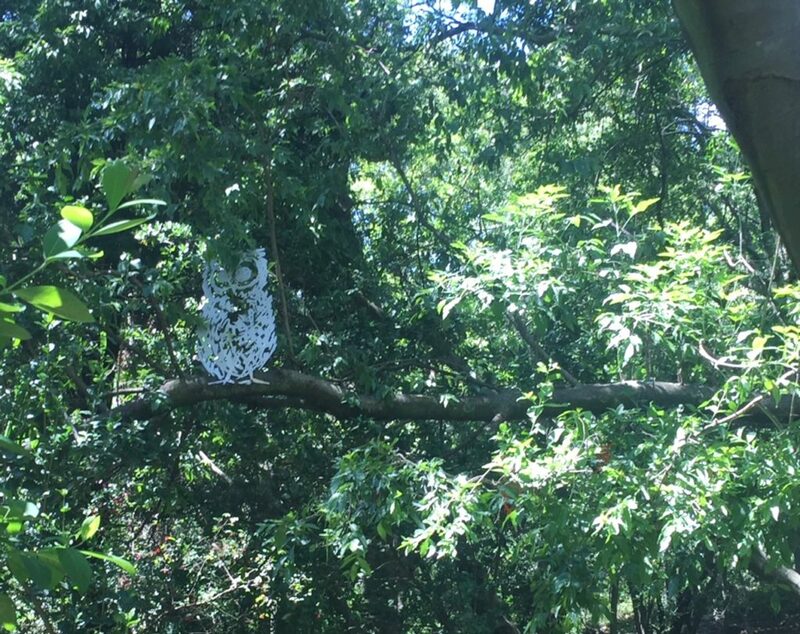 Fascinated by these appealing birds, James envisioned a number of them inhabiting the yellowwood copse. 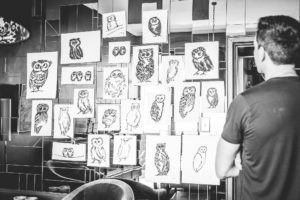 He started with drawings of owls – each completely different in style, size and stance. These were them turned into electronic images with the help of a graphic designer. And finally Aluminium Trading Company produced the metal cut-outs. 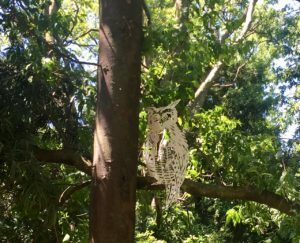 Launched on Mandela Day July 2017 the owls, 67 of them, found their home in the branches of the yellowwood copse. 67 was the iconic number which started to circulate after the first Mandela Day was declared on 18th July 2009 and represented Mandela’s years of public service until 2009. On 26th November 2017 there was a “Reclaim the Wilds” day and a friend and I finally made it to enjoy and experience this new look Wilds. My friend was very nostalgic as it had been her family’s favourite outdoor place when she was a child and then she in turn took her children there for lots of adventures in ‘deep dark woods’. The greenhouse (still in disrepair and needing TLC), the stone paths, the water features, the lawns and views all stirred wonderful memories for her. I went back with my family and small grandsons and was just as enchanted second-time around. 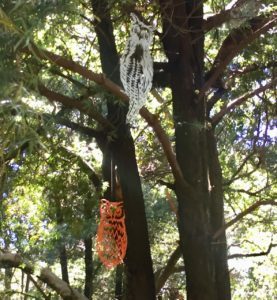 I wrote in a blog on holiday activities for kids, that looking for these owls is a wondrous mixture of a game viewing experience in the bush, and being in an outdoor art gallery. Adults and children alike are engaged , excited and filled with transformative joy. They are splendid! But you can hear all about this first hand and enjoy exploring as on Sunday 4th February. 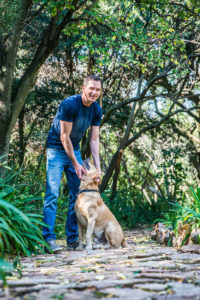 James Delaney and Pablo of course, as well as Brett MacDougall of the #JoburgHeritageAssociation will conduct a walk through the Wilds. ALL proceeds of this tour will go to fund James’s remarkable work in The Wilds. The tour price of R150 is a suggestion – please give as much as you are able to!